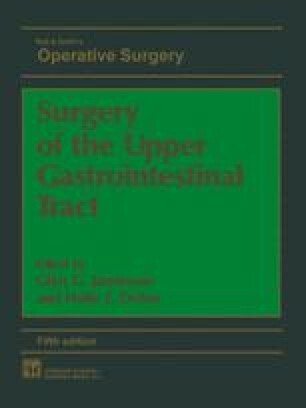 This operation provides a means for resecting the whole thoracic oesophagus through a sequential two-part approach, with anastomosis of the oesophagus to the fundus of the stomach in the neck, from the left side. The principal indication for this approach is resection of tumours of the thoracic oesophagus and cardia1, but it is also applicable to resection of benign oesophageal strictures or the severely disrupted oesophagus2. The main advantages of this method of subtotal oesophagectomy are: that it permits exploration of the tumour as the first part of the operation; that it is quicker and simpler than a right-sided three-part approach, i.e. laparotomy, right thoracotomy and right neck incision; and that it permits dissection of the tumour and its lymphatic or other extensions under direct vision.